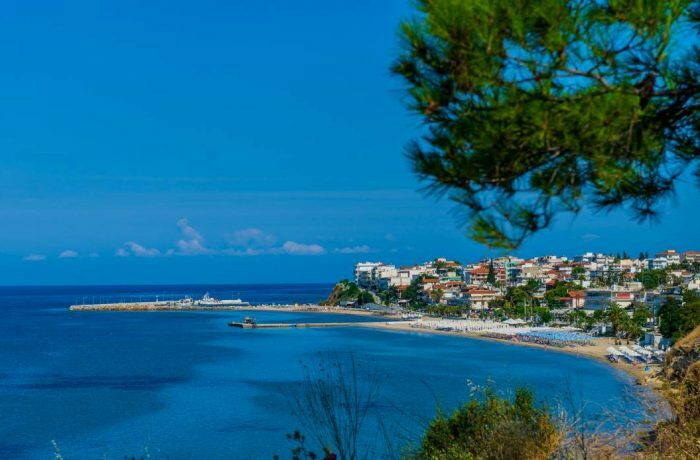 Nea Kallikratia is a small town located just before the peninsula of Kassandra and its name refers to the refugees from Kallikratia in Minor Asia who moved to the village in 1922. Where the past coexists with the present, at the place the Greek refugees from Kallikratia of Marmara chose as their new homeland for its great similarity to their ancestral lands. Where excavations brought to light important archaeological sites such as the ancient pedimented headstone, which represents a young girl with a dove in her left hand. Where the cafeterias, bars, taverns, nightclubs, rooms to rent and hotels along with the fishing shelter make Nea Kallikratia a very popular tourist destination for all ages. Nea Kallikratia has a wide organized beach with shallow waters and golden sand that gets crowded during summertime. There are many tavernas, bars, cafes and a range of nice hotels providing all guests with necessary facilities. The visitors have the opportunity to attend various cultural events (the Festival of the Square within the framework of the Festival of the sea) organizes by Nea Propontida Municipality in cooperation with the Organization of Culture and Sports (OCS). One of the main events of the Festival is the “Saint John, the Kleidonas”. This event lasts many days including theatrical, dancing and cultural performances as well as the revival of the homonymous custom. The above-mentioned summer celebratory events are in fact cultural exchange meetings among the local clubs and clubs from other countries. The easily accessible beaches of Nea Kallikratia are always ready to welcome the visitors while providing moments of relaxation and resting. The magical and long beaches, the soft golden sand and the crystal clear water render Nea Kallikratia one of the first preferences and a steady choice for all tourists visiting the West Coast. The Acropolis of ancient Antigonia located at Nea Gonia, just 5km away from Nea Kallikratia.